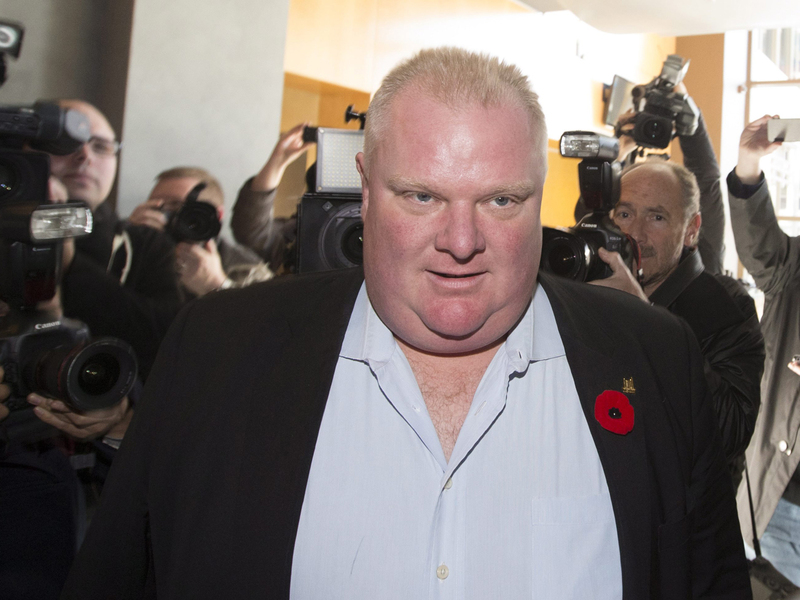 TORONTOToronto Mayor Rob Ford said Tuesday he smoked crack "probably a year ago" when he was in a "drunken stupor," an admission that follows months of accusations during which he has refused to step down. The allegations that he had been caught on video smoking crack surfaced in May. Ford initially insisted the video didn't exist and sidestepped questions about whether he had ever smoked crack. He was forced to backtrack after police said last week they had obtained a copy of the video, which has not been released publicly. "Yes, I have smoked crack cocaine," Ford told reporters outside his office. "There have been times when I've been in a drunken stupor. That's why I want to see the tape. I want everyone in the city to see this tape. I don't even recall there being a tape or video. I want to see the state that I was in." Ford walked out of his office and asked reporters to ask him the question they first asked him in May. He acknowledged he smoked it but said: "Am I an addict? No. Have I tried it, probably in one of my drunken stupors a year ago." Ford previously apologized for excessive drinking and other mistakes but has rebuffed pressure to step down. He had sidestepped questions about whether he has ever smoked crack until now. Earlier Tuesday, Ford's brother, Doug, criticized Police Chief Bill Blair for saying he was "disappointed" in the mayor. Doug Ford called the chief's comments "inappropriate" and "biased" and said Blair should step aside. "We have the most political police chief we have ever seen," said Doug Ford, a Toronto City Councillor. "The police chief believes he's the judge, the jury and the executioner." Another city councilor, John Filion, called Doug Ford's attack against the police chief "appalling" and said the Ford brothers have "crossed the line with not only the alleged behavior, the lack of comment on the behavior, and now attacking the people brought some of that behavior to light." The allegations about Ford smoking crack surfaced when two reporters with the Toronto Star and one from the U.S. website Gawker said they saw the video but they did not obtain a copy. Ford vilified the Toronto Star, accusing the paper of trying to take him down. Municipal law makes no provision for the mayor's forced removal from office unless he's convicted and jailed for a criminal offense. Several members of City Council are moving to strip some of his powers with a motion that would restrict the mayor's ability to remove people from his executive committee and other standing committees. Police have not charged Ford. The mayor has called on the chief to release the tape, but police said they are prohibited from doing so because it is evidence before the courts. Police said the video will come out when Ford's associate and occasional driver, Alexander Lisi, goes to trial on drug and extortion charges. Lisi is accused of threatening two alleged gang members who had been trying to sell the video to the media. Police have said they want to talk to the mayor, but his lawyer so far has declined.